In the environment, oxides are most commonly encountered as nano-objects, thin layers or divided materials. A challenge of the science of oxide surfaces is the microscopic characterization of physical chemistry in the environment. Nano-powders with high specific surface (MgO, ZnO) offer a unique opportunity to control the abundance and nature of the reactive under-coordinated sites (steps, corners) through the operating conditions of synthesis (combustion, CVD) so they can then be analysed (IR, photoluminescence) under ambient conditions. 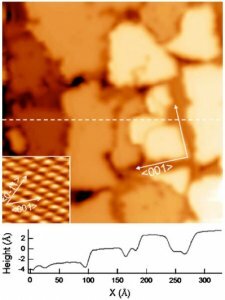 The comparison with the films or crystals studied in parallel, supported by DFT calculations, provides unified microscopic characterization of the model surface from ultra-high vacuum to normal conditions. - Supported thin films (MgO, NiO and ZnO) and the study of the effects that govern growth (magic size, stoichiometry, polarity - especially at the island edges) is close association with the theoretical work (see below). These films are also objects of reference for the study of the reactivity (hydration, hydroxylation) and metal/oxide growth. 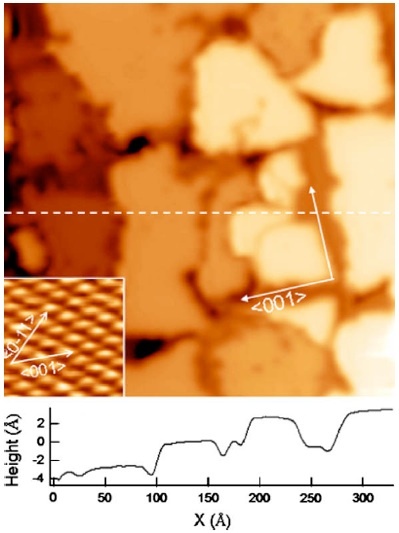 MgO(100) surface steps - Scanning tunneling microscopy image of a thin film of MgO(100) supported on Ag(100) with a height profile showing that the steps observed of dominant orientation <001> are monatomic - Insert : the silver surface with atomic resolution. - Simple nano-crystallites (MgO, CaO, ZnO) and mixed oxide nano-crystallites(ZnMgO and reducible oxides such as TiO2 and CeO2) of size, structure and composition controlled by the preparation conditions are prepared by combustion (smoke), CVD or sol-gel. Four study areas are concerned : - surface properties, playing on crystallography facets, surface/volume ratio and physical defects of known nature and density (steps, corners) ; - responsiveness with respect to water, hydrogen ; - the anti-bacterial character of oxides (ZnO) ; - photo-excitation (reducible oxides). 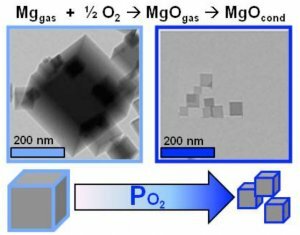 Decrease in crystallite size of MgO smoke depending on the partial pressure of oxygen used for the combustion of magnesium. S. Stankic, M. Cottura, D. Demaille, C. Noguera et J. Jupille, J. Crystal Growth 329 (2011) 52 [link].